Wow, you're in for a real treat...ANOTHER Alex-approved recipe coming at you! 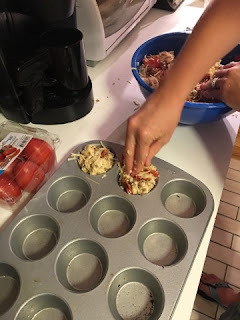 I'm on a roll...two recipes for you in a little over a week! You're getting spoiled now, aren't you?! 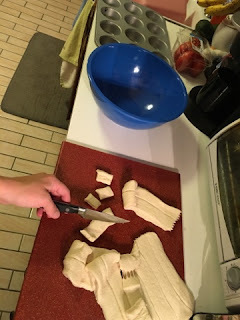 So I saw on Facebook (Tip Hero's page) another recipe that looked 1. easy 2. yummy 3. easy...so I sent it over to Mike and said, "Let's try this soon!" 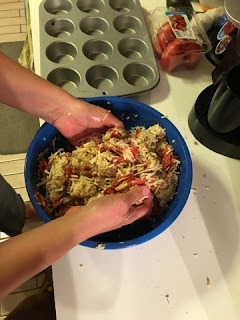 So, alas, Tuesday night rolled around and we had all of the ingredients for this simple dish so we decided to go for it! First off, if you click here you can see the full recipe from Tip Hero. Disclaimer: just like my crock pot lasagna recipe, I modified this one a wittle bit to make it more delicious (in my opinion). So, here's the recipe complete with action pictures that I had Mike lovingly snap as I was elbow deep in pizza puff making. 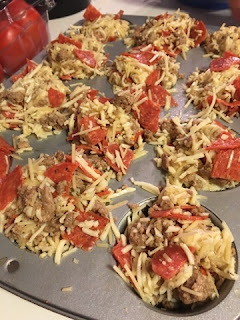 Grab a handful of the dough/cheese/meat concoction and place in the muffin tin. Try not to overflow the tin too much. Pop the pizza puffs in the oven for 20 - 25 minutes...until the tops are golden brown. 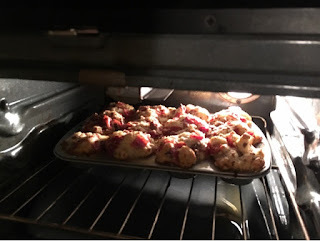 When the tops are golden brown, get them out of the oven, onto a plate, and ENJOY! Use the marinara/pasta sauce as a dipper for your pizza puffs! 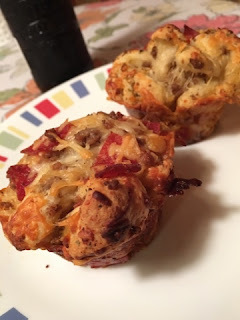 This was another incredibly easy recipe that turned out oh-so-delicious and yummy! Yes, you could throw in awfully disgusting things like peppers or mushrooms or onions and destroy this lovely dish...but what you do in your kitchen is your prerogative, not mine. Anyways, if you make this dish let me know how it turns out and if you like it or not! Um, yum! These look so good! Come on Clarice, don't be allergic to dairy!